Rocky Launch + Botched Authorization = 4 Month of MobileMe FREE! MobileMe: We've already told you about the less than silky smooth launch, the about-face on "push", the exorcising of the "Exchange for the Rest of Us" slogan, and the apology letter from Apple that saw everyone -- even people on the 2 month free trial -- get a FREE month of service tacked on for good measure. What more could go wrong? How about botching the credit card authorization process and having to issue a second apology letter and offer an additional FREE month? Yup. Scaling any business, even one as tightly run and usually incredibly well managed as Apple is a nightmare, and it looks like what with simultaneous iPhone 3G, iPhone 2.0, App Store, and MobileMe launches in up to 20+ countries at the same time is causing some cracks in Apple's traditionally glossy shell. Temporary bump or signs of things to come on the road to 10 Million iPhones and ever-growing Mac sales? Full text of Apple's second apology letter after the break! Apple has identified and resolved an issue that caused an incorrect, temporary authorization hold of 116 CAD to be placed on your credit or debit card when your MobileMe trial account was created. We have addressed the issue and want to apologize for any inconvenience. Look for the extension to be reflected in your account settings in the next few weeks. 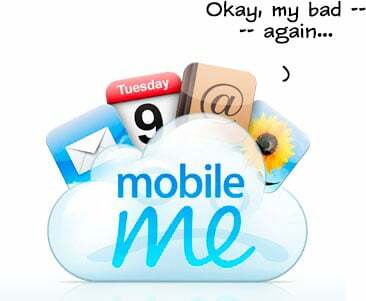 You may now enjoy MobileMe free of charge until 08/11/08, after which your annual paid subscription will begin. Thank you for being a MobileMe customer.